Starring Liam Neeson, Vera Farmiga, Patrick Wilson, Jonathan Banks, Sam Neill, Elizabeth McGovern, Killian Scott, Shazad Latif, Andy Nyman, Clara Lago, Roland Møller, Colin McFarlane, Florence Pugh, Dean-Charles Chapman, Ella-Rae Smith, Nila Aalia, Kobna Holdbrook-Smith, Adam Nagaitis, Kingsley Ben-Adir, Damson Idris and Andy Lucas. Screenplay by Byron Willinger & Philip de Blasi and Ryan Engle. Distributed by Lionsgate. 104 minutes. Rated PG-13. What would you do if you were asked to perform a task that would profoundly affect one person? You would not know the consequence to that person, and you would get a significant reward? This is the gist of the question posed to Michael MacCauley (played by Liam Neeson) by the mysterious Joanna (played by Vera Farmiga) at the start of his homeward bound daily commuter train. Michael’s day had already gone off its normal insurance industry tracks. He is at the end of a really bad day. He is vulnerable; with a son about to go off to college and two mortgages already out on his home. His previous career as a cop makes him uniquely qualified for the task at hand. His curiosity gets the better of him as he goes in search of the first quarter of the task reward, hidden in the train bathroom. Once Michael finds and takes the money, he has made his choice to proceed with the deal. There is no backing out, those are the conditions. Before the train reaches the end of the line in Cold Spring, New York, his task is to: a) identify a person on the train, carrying a bag, that does not belong (they are not a daily commuter) and b) tag the bag with a GPS device. An exercise in deductive reasoning, Michael quickly works out that he can figure out the Cold Spring travelers by the zone on the stub left by the conductor when he checks for tickets. At first, he approaches the task with an almost cavalier ease. But he begins to realize the gravity of the situation when Joanna seems to know his every move and shows that his lack of follow through will put his family at risk. The Commuter starts well, and Michael’s situation is relatable and well performed. He is a man like so many others in the daily commuter grind. He has a wife (played by Elizabeth McGovern – am I the only person who remembers her and am dumbfounded by her completely throwaway role in this film?) who drops him daily at the Kiss and Ride, a teenaged son, and a steady job. The film does a good job showing us the boring, minute details of the day in the life of Michael MacCauley. In fact, it continues to do a fine job for most of its commuter characters, showing us small windows into their lives – and really, what more does anyone know about any other fellow commuters on a train than this small window? 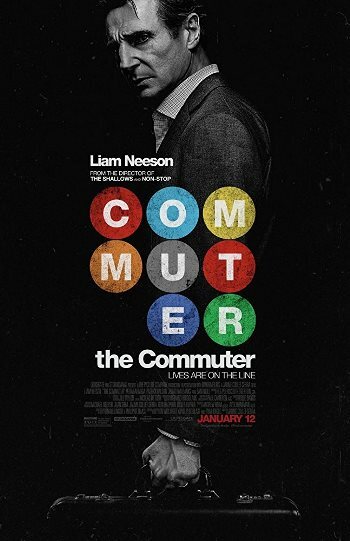 The Commuter is the fourth movie collaboration between Liam Neeson and Director Jaume Collet-Serra. (The other three collaborations were Unknown, Non-Stop and Run All Night.) They work well together on action-packed, sometimes-believable films that keep you on the edge of your seat. Then the action of the moment ends, and you are left working through the many plot holes. At times the camera work was super wobbly, like a deliberate, stylized distraction from the story, encouraging the viewer to just go along with the action flow. For sure, The Commuter is entertaining, and the audience collectively laughed and cheered and gasped at all the planned points. The 1 hour 44-minute runtime sped by and there were twists and turns (some predictable, some not) that kept the audience engaged. In the end, the charm of learning more about the commuters and the movie’s action flow kept me in the theater, while the overall plot line would have had me walking about midway through. But hey, it’s January, it’s cold out and there are far less entertaining ways to spend your time. I suspect this will be a movie that my dad and I will be watching on the sofa over the holidays next year. Copyright ©2018 PopEntertainment.com. All rights reserved. Posted: January 12, 2018. Tags: Adam Nagaitis, Andy Lucas, Andy Nyman, Bonnie Paul, Byron Willinger, Clara Lago, Colin McFarlane, Damson Idris, Dean-Charles Chapman, Elizabeth McGovern, Ella-Rae Smith, Florence Pugh, Jaume Collet-Serra, Jonathan Banks, Killian Scott, Kingsley Ben-Adir, Kobna Holdbrook-Smith, liam neeson, movie review, Nila Aalia, Non-stop, Patrick Wilson, Philip de Blasi, PopEntertainment.com, Roland Møller, Run All Night, Ryan Engle, Sam Neill, Shazad Latif, The Commuter, Unknown, Vera Farmiga. Bookmark the permalink.